Incredible home now available for rent, this lovely and highly desirable Rocklin home closely located to Valley View, Breen and Twin Oaks Elementary Schools, and, as well, Rocklin Independent Charter Academy School. An easy .05 mile to Granite Oaks Middle School and .03 mile to Rocklin High School. This is a family friendly gated neighborhood located in Whitney Oaks with a community center, large crystal blue pool, spa and dedicated fitness area. 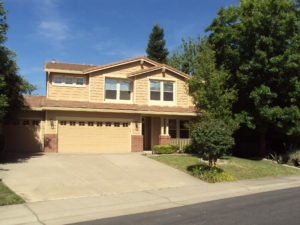 As you walk in the front door of this house, you are greeted by a combination of wood flooring and fresh carpeting. Elevated ceilings in the family room create a feeling of spaciousness. This is a two-story, 4 bedroom, 3 bath square foot home with gorgeous pocket garden views out each window. The family room area has a large hearth fireplace and opens up to the kitchen with a dining area and elevated bistro for extra seating. All rooms have ample windows for sunlight and fresh air with excellent privacy. The front yard is tastefully appointed with a combination of grass, plants and flowering indigenous shrubs. The back yard has a large patio plus grass area with flowering plants that elevate up the hillside with expansive views. Home is complete with a secure three door garage with one bay having easy loading capabilities with both front and back garage doors.